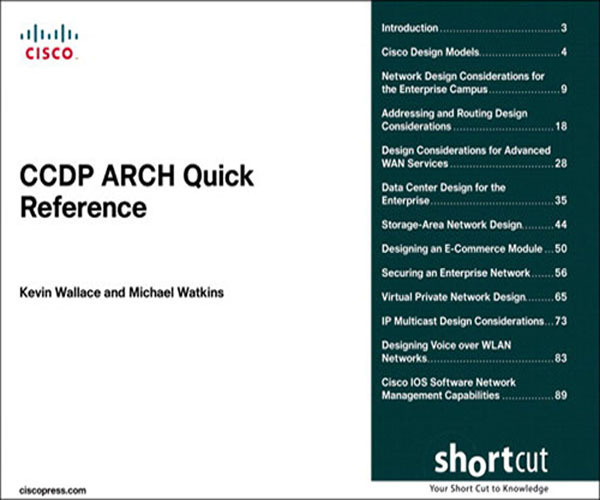 As a final exam preparation tool, the CCDP ARCH Quick Reference provides a concise review of all objectives on the new CCDP ARCH exam (642-873). This digital Short Cut provides you with detailed, graphical-based information, highlighting only the key topics in cram-style format. With this document as your guide, you will review topics on campus and data center design, addressing and routing, advanced WAN services, SAN design, VPN design, IP multicast design, voice over WLAN design, secure designs, designing an e-commerce module, and network management with Cisco IOS Software. This fact-filled Quick Reference allows you to get all-important information at a glance, helping you focus your study on areas of weakness and to enhance memory retention of essential exam concepts.